15-30 minutes PRIOR and 15-30 minutes AFTER is very big difference in case of emergency nuclear event. So, Protectan has no competitor now in treatment of ARS. Strongly recommended for investment in late 2011 (Q III-IV). Medium risk, high reward. 09/17/10 - Cleveland BioLabs, Inc. today announced that it was awarded a $45 million contract (including options), from the United States Department of Defense (DoD) Chemical Biological and Medical Systems (CBMS) Medical Identification and Treatment Systems (MITS) to develop and stockpile CBLB502 as a medical radiation countermeasure. Under the terms of the contract, the CBMS-MITS will initiate funding for Cleveland BioLabs' advanced development of CBLB502 through Food and Drug Administration (FDA) approval in the amount of $14.8 million (including options). Upon FDA licensure, the contract provides options for the purchase of $30,000,000 worth of CBLB502 troop equivalent doses. The DoD selected CBLB502 under a best value acquisition as part of an open and competitive solicitation with pre-specified criteria that included safety and efficacy data, manufacturing capacity, soundness of the development plan, and proposed schedule. Today news about the conflict between North Korea and South Korea may heat investor's interest to CBLI. The reason is the North Korea nuclear bombs and its unpredictability. Of course, the probability of using these nuclear bombs is very low but it's real. 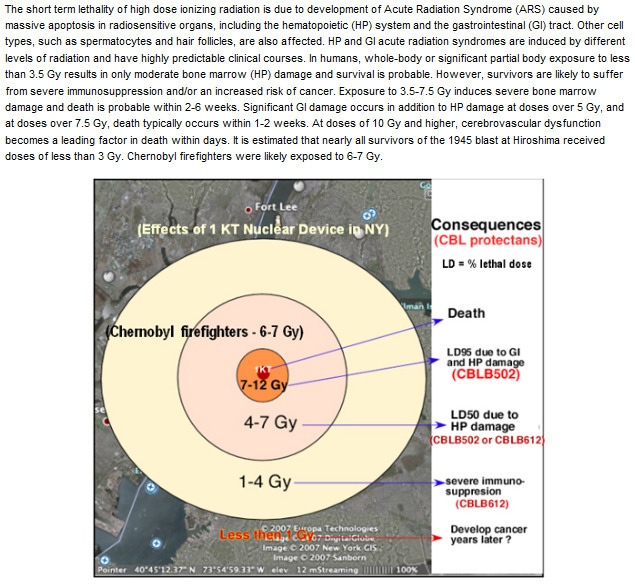 The United States has 28,000 troops in South Korea and in case of nuclear conflict these soldiers don't have any drugs for the treatment of Acute Radiation Syndrome (ARS). So do South Korea military and civilians. The only one biotech company has this drug in late stage: Cleveland BioLabs. Sure that the governments of such countries as South Korea, India, Israel want to have some strategic stockpile of Protectan. And they could buy it before FDA approval. Disclosure: I don't have CBLI in my portfolio, the attentive monitoring of CBLI pps and trade volumes is recommended. 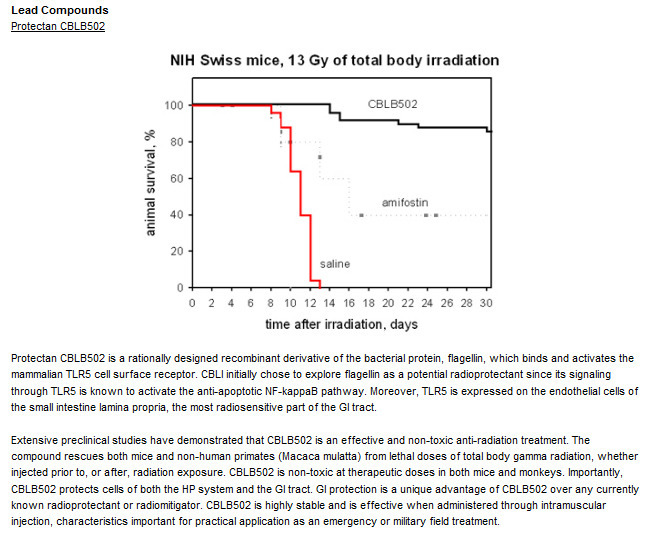 CBLI’s unique approach of pharmacological modulation of apoptosis is ideally suited to address the need for effective radiation countermeasures. The company is currently developing derivatives of microbial factors that are natural regulators of apoptosis as Protectans, molecules that prevent death of normal cells in the face of stresses such as radiation. As described below, the lead Protectan compounds CBLB502 and CBLB600 series have significant activity as both radioprotectants (injected prior to radiation exposure) and mitigators of radiation damage (injected after radiation exposure). The underlying principle of radioprotection by Protectans and their structures and uses represent the intellectual property of CBLI developed in collaboration with the Cleveland Clinic. Today news inspired me to buy CBLI for long. "Cleveland BioLabs' CBLB502 Granted Orphan Drug Status From FDA for Prevention of Death Following a Potentially Lethal Dose of Total Body Irradiation During or After a Radiation Disaster. Orphan Drug status qualifies CBLB502 for an accelerated review process, tax credits, financial assistance for development costs, and seven years of marketing exclusivity upon approval by the FDA for this indication. The designation also allows for a possible exemption from the FDA-user fee and assistance in clinical trial protocol design." Sure that this is great news for CBLI. It will attract attention of many countries that are in danger of possible Radiation Disaster. They could order the significant amount of CBLB502 to create the national emergency stockpile for treatment of ARS. CBLI has strong science basis (the evidence of CBLB502's mechanism of action and activity in animal models was published in Science Magazine in April 2008 (Science, 2008, vol. 320, pp. 226-230). Well, if Protectan has anticancer activity market will be much wider. It's long way even before phase I trial but these news may heat CBLI pps to stable $10 range this year. Disclosure: I opened CBLI position today (had it but closed because think it will be long no-news period). "On January 13, 2011, the Compensation Committee of the Board of Directors of Cleveland BioLabs, Inc. (the "Company") approved the increase in base salary, the payment of cash bonuses and the issuance of stock options to its executive officers: Michael Fonstein, Yakov Kogan, John A. Marhofer, Jr., and Andrei Gudkov. The base salary increases, which will go into effect on January 1, 2011, cash bonuses and award of stock options are in recognition of Company performance in 2010. The cash bonuses are payable in January 2011 and the stock options will be awarded in compliance with the Company's Equity Award Guidelines and Insider Trading Policy and will vest immediately when granted. Disclosure: I don't have a CBLI positions any more and will avoid it in nearest future.